Lingerie Pink is a gorgeous frost pastel pink shade, which kind of reminds me of MAC’s Lady Gaga lipstick; only the YSL one is a bit lighter. I love wearing #7 during spring because I am all about the pastels for that season! Also the shade is great for spring and summer because I have more tan and the lipstick compliments my skin tone beautifully! It’s not like I don’t wear Lingerie Pink during fall and winter, I do but I feel like that the color washes me out a bit when I am paler. If you rather dark skin tone, though, I am not sure how this shade would suit you, but I definitely recommend switching it before buying it cuz this particular shade is a bit pretentious hehe! 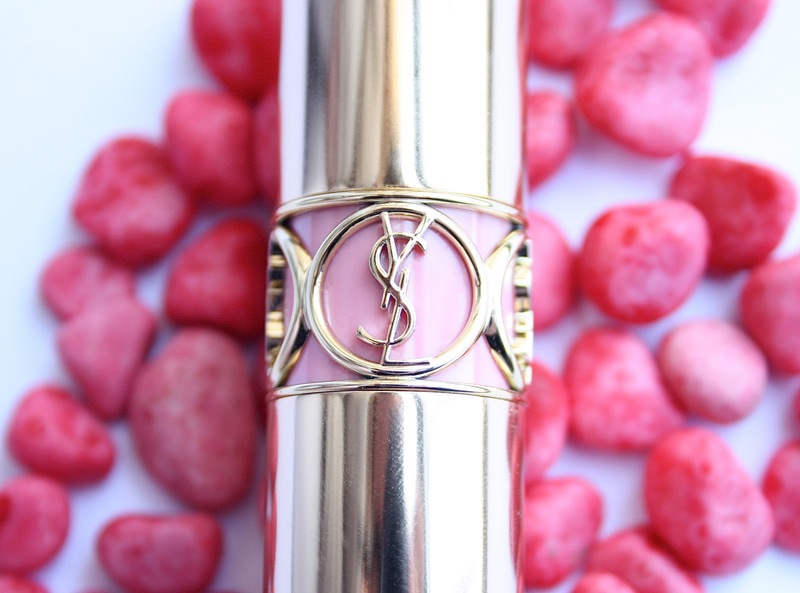 Being YSL’s Best Sellers Rouge Volupte lipsticks have a lot to offer in the formula department. They are the most creamy, pigmented and moisturizing lipsticks that I have ever tried! I kid you not – the quality is impeccable! They have a light silky texture, which is sooo smooth on the lips! Rouge Volupte have a little bit ‘wetter’ formula, which pretty much guarantees you that you lips won’t dry out and will stay moisturized. And this comes from a person who has incredibly dry lips! :) The pigmentation is insane! I can only dab the lipstick lightly on the lips and they will be perfectly opaque! 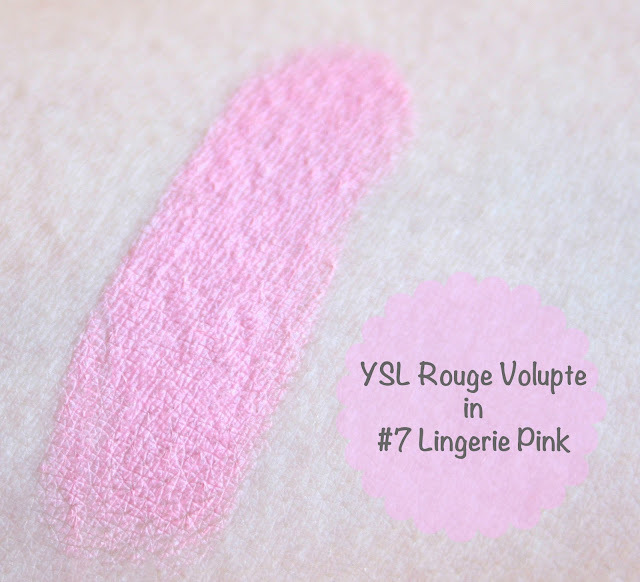 Lingerie Pink (as of course the other lipsticks from the Rouge Volupte line) has a beautiful glossy finish and you don’t have to wear lip-gloss on top of it! :) The lipstick also has a nice scent to it, but it’s not overwhelming in any way. One problem that many people seem to have with the Rouge Volupte lipsticks, however, is that they are not very long lasting. On me it wears for about 1-2 hours but it doesn’t bother me much tbh. The shade looks gorgeous, I wouldn't mind reapplying it lol, xoxo. The packaging is so pretty, and luxe. I do like the lovely pink shade but not sure if it would suit me. oh god, thats the prettiest pink ive ever seen! These lipsticks have made such a statement in the blogosphere that I really want to get one, but at the price they are I really want to choose my colour wisely hahaha. This looks amazing! Though I think the colour may not suit my skintone very well, baby pinks always wash me out! I hope I'll own one of these lippies one day, haha. pink color is very nice and well suited to use when spring arrives. Lips become fresh and exciting. The packaging is very nice and luxurious. This lipstick will be a recommendation for everyone. wow, thanks for sharing this post rossy!!! Love your blog. tosi mi e nai lubimiat! imam syshto rouge volupte 27 rose paris! mersi za tvojat komentar! mnogo se radvah :) veche sam ti posledovatel! I have one too and I looooooooooove the packaging! So precious! This lipstick looks soooo amazing. that whole thing is so cute...very pink!!! Very thorough review! I love the pink. Super pretty. Pretty colour and gorgeous packaging! Hi! 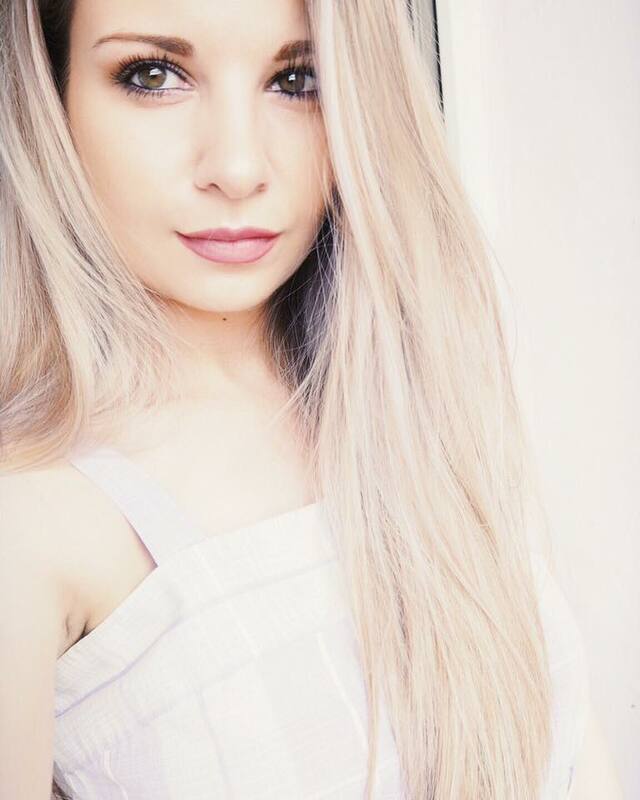 I´m your new follower because I have liked very much your blog. I can read it in Enlish and... you have fantastic photos! and I think that it´s very important for a blog. I love your lipstick. A great colour! I am dying to get my hands on one of these and now I want this shade too to add to my long list. The packaging is definitely gorgeous and stands out so much. 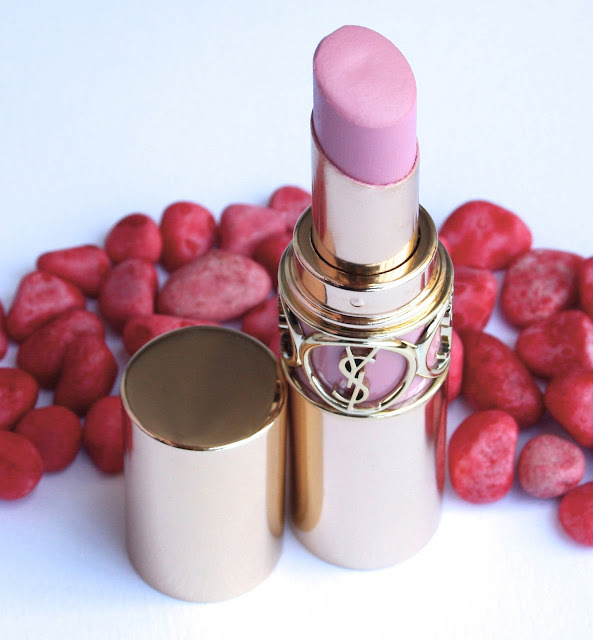 Wow, this is such a gorgeous lipstick!! Love its design and colour!! Following you now! I'd love it if you'd follow back! I love that colour it's so pretty. I purchased a YSL lipstick in the January sales and it stays on forever! following you now on GFC and Bloglovin'! I can't get over how much I love this lipstick! It's a perfect baby Barbie pink. Can't wait to get my hands on it! This heavy sense color rouge must be great for prom party under the dim lights. For red rouge color,we choose warm colored prom dress.